An international team of astronomers, led by R. Amorin and ohter ASTRODEEP scientists, has pushed large telescopes to their current limits to discover a population of tiny newborn galaxies more than 11 billion light-years away, which shed new light into the first stages of galaxy formation. Although rare, these nascent objects reveal with unprecedented detail the extreme physical conditions that have existed in the first galaxies formed right after the Big Bang. These results have been published in Nature Astronomy. The birth and very early evolution of galaxies —such as our own Milky Way— in the first few hundred million years after the Big Bang is still mostly hidden to our observational exploration. Over the past decades, astronomers have pushed observations of galaxies out into the so-called “Dark Ages”, the period corresponding to the first 700 million years after the Big Bang, when the universe was filled by a dense fog of neutral hydrogen. However, these first galaxies are very faint and embedded in an opaque intergalactic gas, which precludes detailed studies of their light emission with current observatories. As a result, the birth and very first phases of galaxy growth have never been studied in detail. To identify and study the properties of newly born galaxies, a large international team of astronomers has taken a different approach in a new study published in the March issue of Nature Astronomy. Indeed, new galaxies were continuously formed even after the Dark Ages end, although at smaller pace. The team presents the discovery of nascent galaxies observed at a later cosmic time, just one billion years after the end of the Dark Ages, when the Universe was just about 5% of its current age. Being somewhat closer and clean from the surrounding fog, these galaxies are easier to study in more detail, thus revealing all the intriguing properties of galaxies in their earliest days. This discovery required a great deal of observational effort, coordinated in the VIMOS Ultra-Deep Survey (VUDS), the largest spectroscopic survey of distant galaxies conducted so far at the Very Large Telescope (VLT) of the European Southern Observatory in Chile. 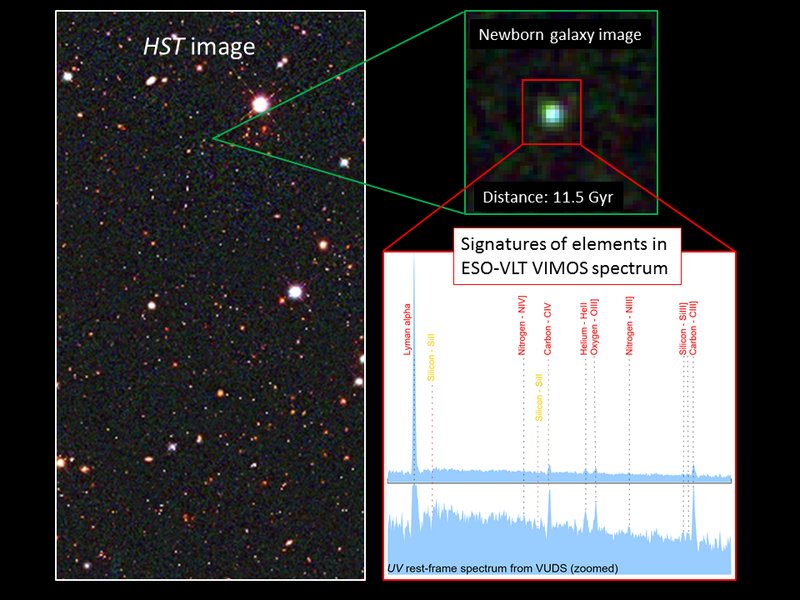 With very sensitive spectroscopy from the VIMOS spectrograph at the VLT and images from NASA’s Hubble Space Telescope, the team could study the properties of these infant galaxies with exceptional detail. “For the first time, we can observe a population of extremely young, newly-born galaxies, presenting all the properties that are expected to be ubiquitous in normal galaxies at much earlier times. We can study their physical conditions with unprecedented detail”, says Ricardo Amorín, from INAF-Osservatorio Astronomico di Roma and now working at University of Cambridge. The spectra obtained with VIMOS reveal that the galaxies are very rich in ionized gas, “with very little amounts of dust and metals, such as carbon and oxygen, which are released by recently formed, short-lived massive stars” says Enrique Perez-Montero, from the Instituto de Astrofísica de Andalucía and co-author. These hot stars can illuminate (ionize) the surrounding gas clouds before they die as powerful supernova explosions, producing large-scale gas flows pushing gas and metals away, a mechanism that might explain how their primitive counterparts polluted the universe with metals and cleared up their neutral intergalactic gas haloes, thus contributing to the end of the Dark Ages, authors explain. Adriano Fontana, from the INAF Osservatorio Astronomico di Roma and co-author of the study, explains: “We are catching these galaxies in what seems to be the first massive episode of star formation, making them unusually luminous”. “We were able to find 10 of these rare and remarkable galaxies thanks to deep observations of an unprecedented large number of more than two thousand galaxies”, adds Olivier Le Fèvre, from the Laboratoire d’Astrophysique of Aix-Marseille University and principal investigator of the VUDS program. Images from the Hubble Space Telescope reveal that they are typically 30 times smaller and 100 times less massive than the Milky Way, with compact and irregular shapes that in some cases resemble tadpoles and pairs of merging galaxies. The galaxies discovered in this study shed new light onto the still largely unknown process of galaxy formation, and paves the way for a better interpretation of observations with the future James Webb Space Telescope to be launched in 2018. A revolutionary and exciting era in observational cosmology and galaxy formation studies that just started.